Create your cellar via the internet free of charge and make the most of an easy, confidential service. Whether you’re a novice, a confirmed wine-lover or a collector, anyone who shares a fascination with wine in general and Bourgogne in particular will find this an essential tool. Organizing a cellar is often a real headache. Bottles come and go, it’s hard to know exactly what you have in there and when is the best moment to open each bottle. This is true even when you don’t keep a large cellar. Record the appellation, the vintage, the producer’s name : the wine entry is then accompanied by tasting advice, culinary combinations, etc. Keep an archive : photographs of bottles, notes on when a wine was drunk, the friends who were present, and so on. This can easily be shared on social networks. 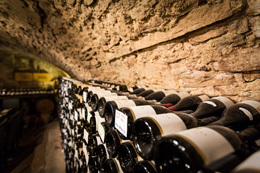 100 appellations and 1400 entries for Bourgogne wine producers are already listed. But you can also use this tool for your wines from other regions. Create your account and access free to: organize your cellar directly online. Benefit from practical advice and improve your knowledge of our 100 appellations and more than 3,000 wine producers. Follow these easy steps and become an expert. You have bottles but you are not yet registered?